Why is this Subarea Important to Salmon? 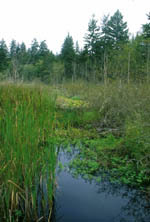 In this subarea, both Bear Creek and Cottage Lake Creek provide excellent spawning and rearing habitat for chinook, coho, sockeye and kokanee salmon and steelhead trout. Fish access and passage barriers, loss of channel complexity and altered hydrology are among the major factors contributing to salmon habitat decline here. Follow the external links to learn what each jurisdiction is doing to improve habitat for salmon. * Indicates that volunteer opportunities or other specific salmon related information are available on this site. Salmon habitat projects in the Bear Creek Subarea funded through the WRIA 8 collaborative process are now included in the Habitat Work Schedule (HWS) state-wide website. In the website, click on the WRIA 8 watershed on the state map to enter our HWS website.